I've heard about anthrax in people. Should I be concerned for my cat? Unfortunately, anthrax is being used as a method of bio-terrorism and cats can be infected, as can most mammals. Birds are normally resistant to the disease. Different animals have different levels of susceptibility to anthrax infection. Herbivores (animals that eat plants, such as cattle, sheep, and horses) are the most susceptible to anthrax. Humans are also susceptible to anthrax while cats are less susceptible to infection. Under normal circumstances, cases of anthrax in cats are very rare. Anthrax is an infection caused by the bacterial microorganism, Bacillus anthracis. 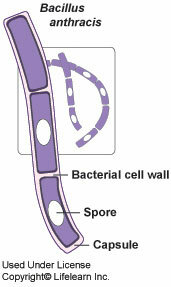 This type of bacterium can develop small spherical bodies called spores within the bacterial cell. These spores, each of which can develop into a new anthrax bacterial cell, are much more capable of surviving in the environment than the more fragile parent cell. Additionally, these spores are more resistant to disinfectants. Spores may survive in the environment for many years. Fortunately, it takes a large number of spores to cause an infection that result in clinical signs of anthrax. Anthrax is not normally contagious from animal to animal. Most livestock infections occur by inhalation or ingestion of spores from pasture that has been contaminated by a decomposing infected carcass. In predators such as cats, ingestion of infected meat is the usual route of infection. In people, it has typically been diagnosed in farm workers, veterinarians, and slaughterhouse personnel who have handled infected carcasses. Even then, it usually takes a high dose of spores to cause more than a local skin infection. In the past, sheep fleeces were a common source of anthrax spores and anthrax in those workers was called "wool-sorters disease". Anthrax can cause different types of disease. A skin form, most common in people that come in contact with the anthrax organism or its spores, causes in local inflammation and the formation of black pustules. An intestinal form, which occurs when large numbers of organisms are ingested and the intestinal lining becomes inflamed, causes bloody diarrhea. A pneumonic form develops when large numbers of the anthrax organism or spores are inhaled into the lungs, causing pneumonia and respiratory problems. The infection can have a generalized form, affecting most or all body systems, including the brain. "The rare cases reported in pet animals have usually been the intestinal form of anthrax." The rare cases reported in pet animals have usually been the intestinal form of anthrax, caused by eating infected meat. There is acute gastroenteritis with vomiting and diarrhea. The throat may be swollen and there may be visible swelling of the neck extending to the face and head. The tongue and lips may also be affected. The anthrax bacterium is susceptible to a number of antibiotics. "Treatment is highly effective in the early stages of infection." Currently the antibiotic of choice in humans is "cipro" (ciprofloxacin). Treatment is highly effective in the early stages of infection. Can my cat be vaccinated against anthrax? There is currently no commercial anthrax vaccine licensed for use in cats, although a number of vaccines of varying effectiveness have been produced. In some parts of the world, domestic livestock and humans employed in high-risk occupations may be vaccinated.